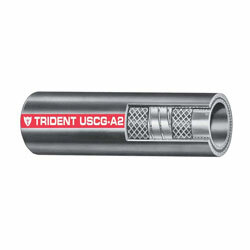 Trident Premium Marine Fuel Fill Hose Type A2-CE #327 is designed for all marine fuel types including those with alcohol blends. Newest evolution is A1-15, which meets new higher EPA standards for ultra low permeation. SAE Size 28, Clamping Range: 1-3/4" to 2-1/4"